Family physician in Kitchener, Ont, Director of the Centre for Family Medicine Memory Clinic, Director of Primary Healthcare Education at the Schlegel-UW Research Institute for Aging, and Associate Clinical Professor in the Department of Family Medicine at McMaster University in Hamilton, Ont. Objective To provide family physicians with a structured approach to patients presenting with memory difficulties. Sources of information The approach is based on an accredited memory clinic training program developed by the Centre for Family Medicine Memory Clinic in partnership with the Ontario College of Family Physicians. Main message Use of a structured clinical reasoning approach can assist physicians in achieving an accurate diagnosis in patients presenting with memory difficulties. Delirium, depression, and reversible causes need to be excluded, followed by differentiation among normal cognitive aging, mild cognitive impairment, and dementia. Obtaining collateral history and accurate functional assessment are critical. Common forms of dementia can be clinically differentiated by the order in which symptoms appear and by how cognitive deficits evolve over time. Typically, early signs of Alzheimer dementia involve impairment in episodic memory, whereas dementia involving predominantly vascular causes might present with early loss of executive function and relatively preserved episodic memory. Frontotemporal dementia and Lewy body spectrum disorders might have early loss of executive function and visuospatial function, as well as characteristic clinical features. Conclusion A clinical reasoning approach can help physicians achieve early, accurate diagnoses that can guide appropriate management and improve care for patients with memory difficulties. Achieving an early, accurate diagnosis is therefore an important first step in helping to guide appropriate further management for these patients. Medical education literature suggests that use of a clinically relevant framework or scaffolding can help in assessing patients with complex problems,17,18 and applying a structured clinical reasoning approach might help family physicians to simplify the process of assessing patients who present with memory difficulties. Mrs S. is a 73-year-old patient presenting with memory difficulties. Her medical history includes atrial fibrillation, transient ischemic attack 5 years ago, diabetes, hypertension, hyperlipidemia, osteoarthritis, urinary incontinence, and depression first noted 3 years ago. Her current medications include 20 mg of citalopram once daily; 1 mg of lorazepam at bedtime as needed; 2 mg of warfarin once daily; 2 tablets of a combination of 300 mg acetaminophen and 30 mg of codeine, 3 times daily; 5 mg of bisoprolol once daily; 25 mg of hydrochlorothiazide once daily; 10 mg of atorvastatin once daily; 0.125 mg of digoxin once daily; 5 mg of ramipril once daily; 5 mg of glyburide twice daily; and 2 mg of tolterodine twice daily. She is a retired bookkeeper and has 3 children. She is accompanied by her husband and daughter. During the past 2 years, family members have noticed increasingly frequent missed bill payments and medication errors. Mrs S. now has difficulty with meal preparation and can no longer manage chores. She repeats questions and gets lost in familiar environments. Her daughter is concerned about Mrs S.’s ability to drive. The approach described below is based on a Mainpro-C accredited memory clinic training program19 developed by the Centre for Family Medicine (CFFM) Memory Clinic20 with the support of the Ontario College of Family Physicians. AD—Alzheimer dementia, ADLs—activities of daily living, CBC—complete blood count, CFFM—Centre for Family Medicine, CT—computed tomography, DLB—Lewy body dementia, FTD—frontotemporal dementia, MCI—mild cognitive impairment, MRI—magnetic resonance imaging, PDD—Parkinson disease dementia, TSH—thyroid-stimulating hormone, VaD—vascular dementia. *Recommended laboratory investigations and imaging are consistent with the fourth Canadian consensus guidelines. Criteria for ordering cranial imaging (CT or MRI) for suspected dementia include age < 60 y; rapid or unexplained decline in cognition or function; dementia of relatively short duration (< 2 y); recent, serious head trauma; history of cancer; use of anticoagulants or history of a bleeding disorder; history of urinary incontinence and gait disorders early in the course of dementia; unexplained neurological symptoms; presence of any new localizing sign; unusual or atypical cognitive symptoms or presentation; gait disturbance; or if the presence of unsuspected cerebrovascular disease would change clinical management. The Confusion Assessment Method diagnostic algorithm: The diagnosis of delirium requires a present or abnormal rating for criteria 1 and 2 plus either 3 or 4. It is important to exclude reversible causes,23–25 as outlined in Figure 1.21–25 If none is identified, the next step is to determine whether the patient’s memory difficulties represent “normal” cognitive aging, mild cognitive impairment (MCI), or dementia. These represent a continuum of cognitive states in the elderly. Normal aging is characterized by patients’ subjective complaints of memory loss but no substantially abnormal findings on cognitive testing.35 Slower processing speed and naming difficulties particularly with proper nouns can be common manifestations of normal cognitive aging,36 but, typically, forgotten memories are recalled with cues. Mild cognitive impairment refers to the symptomatic predementia stage and has a prevalence of 16.8% in those 65 years of age and older37 and a lifetime conversion rate to dementia of 60% to 80%.38,39 In MCI, there are subjective complaints of memory loss and objective evidence of impairment on cognitive testing, but no substantial decline in functional abilities.39,40 Validated tools such as the Montreal Cognitive Assessment (MoCA) can be used to screen for impairment in various domains of cognitive functioning. Compared with the Mini-Mental State Examination (MMSE), the MoCA is a more sensitive screening tool for the milder stages of cognitive impairment commonly seen in ambulatory care.41 The MoCA is validated for use in various medical conditions, in many different languages, and in several international settings; currently, the Canadian Stroke Consortium and the US National Institutes of Health recommended that the MoCA be used for cognitive assessment. Typical Alzheimer disease is characterized by early episodic memory loss (deficits in recall of recently learned information, often referred to as short-term memory loss), followed by later involvement of executive dysfunction and visuospatial impairment as the pathology spreads from the medial temporal lobe and hippocampus to other areas of the brain.47,48 Much less commonly, Alzheimer disease can present atypically with prominent and early behavioural problems, executive dysfunction, or other focal cortical syndromes.48 On cognitive testing, patients with Alzheimer disease usually demonstrate deficits in episodic memory early in the disease, with impaired 3-word delayed recall on the MMSE or 5-word delayed recall on the MoCA. Mixed dementia remains an enigma with no currently accepted, validated clinical guidelines for diagnosis.45,50 Patients with mixed dementia will have features of both Alzheimer disease and vascular dementia. They will have vascular risk factors but neuroimaging evidence of cerebrovascular infarcts might or might not be present. On cognitive testing, Mrs S.’s MoCA score is 14 out of 30, with 0 out of 5 for delayed recall, impairment on the Trail Making Test and cube drawing, and verbal fluency of just 5 f words. Performance on the clock drawing test is grossly impaired, as is performance on the Trail Making Test Part B, which has numerous errors and requires 5 minutes to complete. She is unable to perform the Luria Fist-Edge-Palm test. She does not appear depressed. A cranial computed tomography scan reveals moderate periventricular microangiopathic changes. Working through the CFFM clinical reasoning model, Mrs S. does not meet the criteria for delirium based on the Confusion Assessment Method; however, her cognition might be adversely affected by lorazepam, codeine, and tolterodine (which has high anticholinergic load), and these drugs should be discontinued and her cognitive functioning reassessed. Her depression is appropriately treated with citalopram. If, after medication adjustment, her cognitive deficits persist, she might have dementia, as shown by impairment in activities of daily living and objective findings of deficits on cognitive testing in episodic memory (delayed recall), executive functioning (trails testing, verbal fluency, Luria test), and visuospatial functioning (clock and cube drawing). The likely diagnosis is mixed dementia, given features of both Alzheimer disease (predominance of episodic memory loss) and vascular dementia (transient ischemic attack and vascular risk factors.) Appropriate management can be initiated, and fitness to drive must be assessed. A 7-step clinical reasoning approach and the use of a Brain Map can assist primary care physicians in assessing patients presenting with memory difficulties. After excluding delirium, depression, and reversible causes, a distinction must be made between normal cognitive aging, MCI, and dementia. Common forms of dementia can often be clinically differentiated by the order in which cognitive deficits appear and by how symptoms evolve over time. Office-based cognitive testing can supplement patient history in sorting out the common types of dementia likely to be seen in primary care. This clinical reasoning approach might help primary care physicians achieve early, accurate diagnosis that can guide appropriate management and improve care for patients with dementia. Diagnostic uncertainty and the complexity of the care required for patients with dementia remain considerable barriers to the early diagnosis and management of dementia in primary care. Early, accurate diagnosis is an important first step in helping to guide appropriate management for such patients. The authors present a 7-step clinical reasoning model to help physicians assess patients presenting with memory difficulties. Office-based cognitive testing can supplement patient history in sorting out the common types of dementia likely to be seen in primary care. La traduction en français de cet article se trouve à www.cfp.ca dans la table des matières du numéro de mars 2013 à la page e129. ↵* The Centre for Family Medicine Memory Clinic Brain Map is available at www.cfp.ca. Go to the full text of the article online, then click on CFPlus in the top right-hand side of the page.
. Practice constraints, behavioral problems, and dementia care: primary care physicians’ perspectives. J Gen Intern Med 2007;22(11):1487-92. Epub 2007 Sep 7.
. Family physicians and dementia in Canada. Part 2. Understanding the challenges of dementia care. Can Fam Physician. Vol. 55. 2009. p. 508-9.e1-7. Available from: www.cfp.ca/content/55/5/508.full.pdf+html. Accessed 2013 Jan 23.
. Barriers to treatment: the unique challenges for physicians providing dementia care. J Geriatr Psychiatry Neurol 2001;14(4):188-98.
. Rapid appraisal of barriers to the diagnosis and management of patients with dementia in primary care: a systematic review. BMC Fam Pract 2010;11:52.
. Undetected dementia in community-dwelling older people: the Canadian Study of Health and Aging. J Am Geriatr Soc 2000;48(11):1430-4.
. Diagnosis and treatment of dementia. 2. Diagnosis. CMAJ 2008;178(7):825-36.
. The detection of dementia in the primary care setting. Arch Intern Med 2000;160(19):2964-8.
. Dementia care in 9 OECD countries: a comparative analysis. Paris, Fr: Organization for Economic Co-operation and Development; 2004. Report No. : 13. Available from: www.oecd-ilibrary.org/social-issues-migration-health/dementia-care-in-9-oecd-countries_485700737071. Accessed 2011 Nov 22.
. Alzheimer’s disease: the benefits of early treatment. Eur J Neurol 2005;12(Suppl 3):11-6.
. Meta-analysis of psychosocial interventions for caregivers of people with dementia. J Am Geriatr Soc 2003;51(5):657-64.
. Use of services by community-dwelling patients with dementia: a systematic review. Am J Alzheimers Dis Other Demen 2011;26(3):195-204. Epub 2011 Jan 27.
. A family intervention to delay nursing home placement. JAMA 1996;276(21):1725-31.
. Missed and delayed diagnosis of dementia in primary care. Alzheimer Dis Assoc Disord 2009;23(4):306-14.
. On truth telling and the diagnosis of Alzheimer’s disease. J Fam Pract 1988;26(4):401-6.
. Early identification and treatment of Alzheimer’s disease: social and fiscal outcomes. Alzheimers Dement 2009;5(3):215-26. Epub 2009 Apr 11.
. Critical thinking and clinical reasoning in the health sciences: a teaching anthology. Millbrae, CA: Insight Assessment, The California Academic Press; 2008. Critical thinking and clinical judgment; p. 1-13.
. How learning works: 7 research-based principles for smart teaching. San Francisco, CA: Jossey-Bass; 2010.
. Building capacity for dementia care: a training program to develop primary care memory clinics. Can Fam Physician. Vol. 57. 2011. p. e249-52. Available from: www.cfp.ca/content/57/7/e249.full.pdf+html. Accessed 2013 Jan 29.
. Enhancing dementia care: a primary care based memory clinic. J Am Geriatr Soc 2010;58(11):2197-204.
. Clarifying confusion: the confusion assessment method. A new method for detection of delirium. Ann Intern Med 1990;113(12):941-8.
. Recommendations of the 4th Canadian Consensus Conference on the Diagnosis and Treatment of Dementia (CCCDTD4). Can Geriatr J. Vol. 15. (4) 2012. p. 120-6. Epub 2012 Dec 4. Available from: www.cgjonline.ca/index.php/cgj/article/view/49/96. Accessed 2013 Feb 4.
. Assessment of suspected dementia. Can J Neurol Sci 2001;28(Suppl 1):S28-41.
. Structural neuroimaging in the diagnosis of dementia. Alzheimers Dement 2007;3(4):333-5. Epub 2007 Sep 10.
. Cobalamin and homocysteine in older adults: do we need to test for serum levels in the work-up of dementia? Alzheimers Dement 2007;3(4):318-24. Epub 2007 Sep 19.
. Occurrence and outcomes of delirium in medical in-patients: a systematic literature review. Age Ageing 2006;35(4):350-64. Epub 2006 Apr 28.
. Delirium in the elderly: a clinical review. Postgrad Med J 2009;85(1006):405-13.
. Delirium in older people. BMJ 2007;334(7598):842-6.
. Anticholinergic activity of 107 medications commonly used by older adults. J Am Geriatr Soc 2008;56(7):1333-41.
. Screening accuracy for late-life depression in primary care: a systematic review. J Fam Pract 2003;52(12):956-64.
. Assessment and treatment of affective illness in the elderly. J Geriatr Psychiatry Neurol 1988;1(2):89-107.
. The criterion validity of the Geriatric Depression Scale: a systematic review. Acta Psychiatr Scand 2006;114(6):398-410.
. The Geriatric Depression Scale and the Cornell Scale for Depression in Dementia. A validity study. Nord J Psychiatry 2006;60(5):360-4.
. The course of geriatric depression with “reversible dementia”: a controlled study. Am J Psychiatry 1993;150(11):1693-9.
. Aging, memory, and mild cognitive impairment. Int Psychogeriatr 1997;9(Suppl 1):65-9.
. Understanding memory dysfunction. Neurologist 2009;15(2):71-9.
. Prevalence and severity of cognitive impairment with and without dementia in an elderly population. Lancet 1997;349(9068):1793-6.
. Progression of mild cognitive impairment to dementia: a challenge to current thinking. Br J Psychiatry 2006;189:399-404.
. Mild cognitive impairment as a diagnostic entity. J Intern Med 2004;256(3):183-94.
. The diagnosis of mild cognitive impairment due to Alzheimer’s disease: recommendations from the National Institute on Aging and Alzheimer’s Association workgroups on diagnostic guidelines for Alzheimer’s disease. Alzheimers Dement 2011;7(3):270-9.
. The Montreal Cognitive Assessment, MoCA: a brief screening tool for mild cognitive impairment. J Am Geriatr Soc 2005;53(4):695-9.
. Diagnostic and statistical manual of mental disorders. 4th ed. Washington, DC: American Psychiatric Publishing, Inc; 2000. text revision.
. DSM-5 development. S 24 major neurocognitive disorder. Arlington, VA: American Psychiatric Association; 2012. Available from: www.dsm5.org/ProposedRevision/Pages/proposedrevision.aspx?rid=419. Accessed 2011 Nov 22.
. Rising tide: the impact of dementia on Canadian society. Toronto, ON: Alzheimer’s Society of Canada; 2010.
. Mixed dementia: the most common cause of dementia? 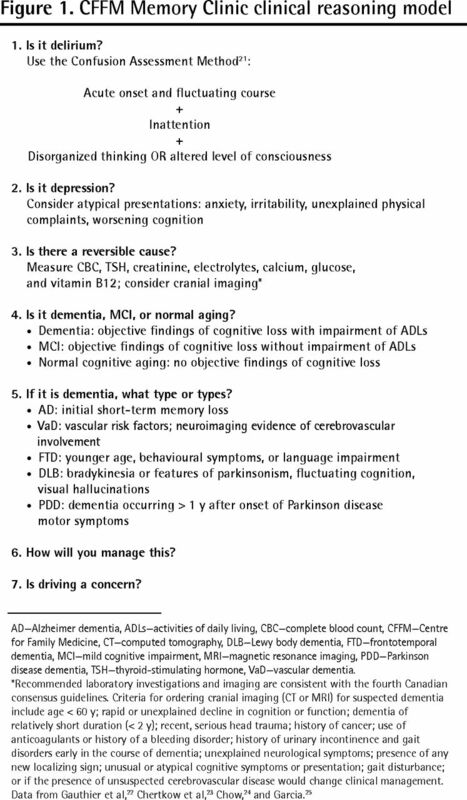 Can J Diagn 2010;27(4):35-44.
. Clinical diagnosis of dementia. Alzheimers Dement 2007;3(4):292-8.
. The diagnosis of dementia due to Alzheimer’s disease: recommendations from the National Institute on Aging and the Alzheimer’s Association workgroup. Alzheimers Dement 2011;7(3):263-9.
. Focal cortical presentations of Alzheimer’s disease. Brain 2007;130(Pt 10):2636-45.
. Vascular cognitive impairment: current concepts and clinical developments. Lancet Neurol 2008;7(3):246-55.
. The enigma of mixed dementia. Alzheimers Dement 2007;3(1):40-53.
. Vascular risk factors and dementia. How to move forward? Neurology 2009;72(4):368-74.
. Executive control function. A review of its promise and challenges for clinical research. J Neuropsychiatry Clin Neurosci 2002;14(4):377-405.
. The mental status examination in neurology. 4th ed. Philadelphia, PA: F.A. Davis Company; 2000.
. The FAB: a Frontal Assessment Battery at bedside. Neurology 2000;55(11):1621-6.
. Frontotemporal dementia. Lancet Neurol 2005;4(11):771-80.
. The Frontal Behavioral Inventory in the differential diagnosis of frontotemporal dementia. J Int Neuropsychol Soc 2000;6(4):460-8.
. Primary progressive aphasia. Ann Neurol 2001;49(4):425-32.
. Cognitive impairment in Parkinson’s disease and dementia with Lewy bodies: a spectrum of disease. Neurosignals 2008;16(1):24-34. Epub 2007 Dec 5.
. Diagnosis and management of dementia with Lewy bodies: third report of the DLB Consortium. Neurology 2005;65(12):1863-72. Erratum in: Neurology 2005;65(12):1992.
. Dementia with Lewy bodies. Lancet Neurol 2004;3(1):19-28.
. CLOX: an executive clock drawing task. J Neurol Neurosurg Psychiatry 1998;64(5):588-94.
. Current pharmacologic treatment of dementia: a clinical practice guideline from the American College of Physicians and the American Academy of Physicians. Ann Intern Med 2008;148(5):370-8.
. Management of dementia with a cerebrovascular component. Alzheimers Dement 2007;3(4):398-403. Epub 2007 Sep 17.
. Clinical practice with anti-dementia drugs: a revised (second) consensus statement form the British Association for Psychopharmacology. J Psychopharmacol 2011;25(8):997-1019. Epub 2010 Nov 18.